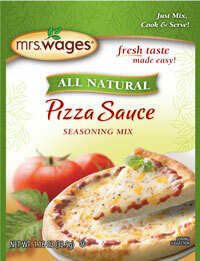 Mrs. Wages Pizza Sauce Seasoning Mix contains just the right spices, with fresh or canned tomatoes, for a delicious homemade pizza you’ll be proud to put on the table tonight! Wash fresh tomatoes. Scald 3 minutes in boiling water. Dip into cold water. Cut out cores, remove skins and puree to smooth consistency in blender or food processor. If using canned tomatoes, drain liquid. Combine seasoning mix, pureed tomatoes, and sugar in a medium saucepan and bring to a boil. Stir occasionally. Reduce heat and simmer 25 minutes. Stir occasionally. Use immediately or pour into container and let cool. Store covered in refrigerator up to 3 days. Food Starch, Salt, Dehydrated Onion, Spice, Paprika, Citric Acid, Dehydrated Garlic.